Ear infections are superb irritating. They can leave a person completely out of commission for days and for children, who are particularly prone to them, an ear infection can last for weeks!! Instead of enduring an earache or visiting the doctor, try this age old self-healing trick. 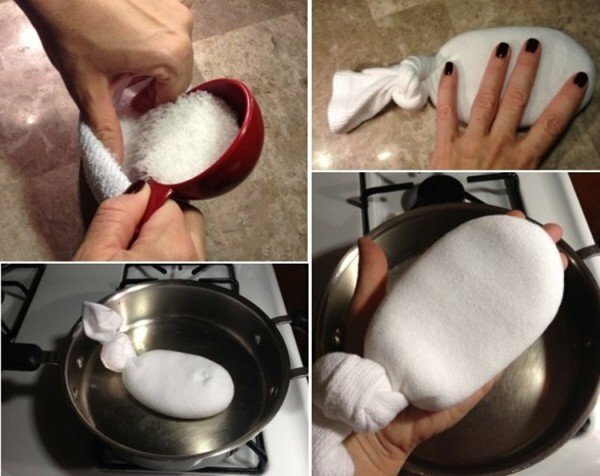 It’s called “the magic salt sock” and all you needs is a clean, plain, all white, cotton sock and about 1½ cups of coarse sea salt. Pour the sea salt into the sock before tying it up and closing it off with a knot. It’s vital that you use these exact two “ingredients” since no alternative versions of them will be nearly as effect colored line on it, you’ll likely end up melting or even burning it. There is something in the coloring which makes them highly flammable, so be aware and use caution. The sea salt also matters because of the larger sized, more coarse granules it comes in and its ability to retain heat. Regular old table salt won’t work and will just seep out of the sock, so don’t substitute it in place of the sea salt! The next step is to warm up a skillet over medium-low heat before placing the salt sock in the pan. Allow it to heat up for about 4-6 minutes and every minute or so flip it over and shake it up so that it heats evenly all the way through. You’ll know the sock is done when it’s very warm to the touch, but not so hot that it might burn you. Finally, all you have left to do is place the heated sock over your aching ear, making sure that it also rests on the area behind your jaw. Sit back and relax as the salt works to alleviate the aches and pains, while simultaneously helping to draw out any toxins in the ear. It’s that simple! This is one of the best ways to naturally and effectively decrease any discomfort or inflammation in the ear that’s causing you pain. In addition to its natural healing properties, warm sea salt is also antiseptic and can draw out any moisture that may be in the ear. Furthermore, the magical salt sock can be reused many times safely and effectively, but it will eventually discolor and you should replace it when it becomes worn, dirty, or old. Please share this information with friends and family, they may find it extremely useful and beneficial as well!